As the festive calender moves away from the Gregorian New Year, we find ourselves in January preparing to celebrate another major event in Melbourne that brings together all of our Chinese community. The Lunar New Year marks 2 weeks of cultural celebration in Chinatown and various suburbs around Melbourne as the Chinese almanac year of the Horse makes way for the year of the Goat. There will be lion and dragon dances, folk music, traditional art, feasting and firecrackers that pay homage to the rich Chinese heritage and community. While its not one of the world's top cities to celebrate Lunar New Year, everyone is invited to join in the celebrations irregardless of your race or culture. In addition, majority of the events are FREE. However you plan to enjoy this festive occasion, here are 11 top ways to celebrate the Lunar New Year in the world's most liveable city. 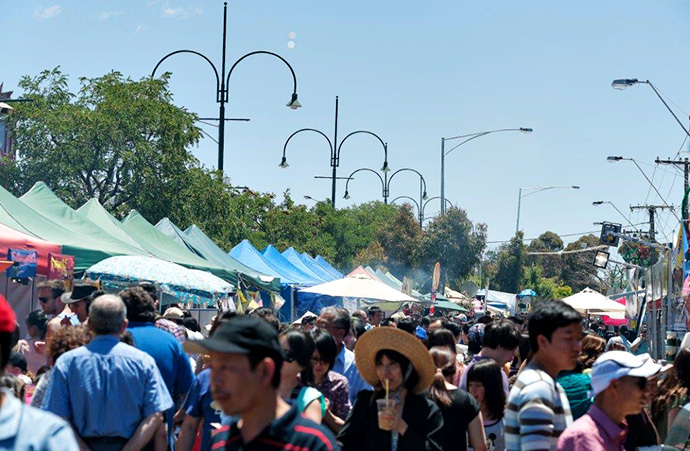 Home to a large ancestry of Vietnamese and Chinese, St Albans kicks off the Melbourne-wide Lunar New Year celebrations this year on 18 January. Alfrieda Street will be transform into a pedestrian walkway from 10am to 10pm for this FREE festival. You and your family can enjoy live entertainment from the main stage, food, shopping, amusement rides and fireworks organised by the St Albans Business Group Association. Richmond's Victoria Street comes alive with one of the most spectacular public celebrations in the City of Yarra on 1 February from 11am to 10pm. The annual festival brings Yarra's Chinese and Vietnamese communities, other residents and visitors together to celebrate the Lunar New Year. You and your family can expect a FREE cultural experience made colourful by Vietnamese pop, Chinese opera, lion dances, twirling dragons and the bang of firecrackers. Don't forget the seemingly endless stream of Vietnamese food that helped Victoria Street claim the name of 'Little Saigon'. St Jerome's Laneway Festival will give way to the East meets West Lunar Festival, organised and run by the Footscray Asian Business Association on 8 February. This FREE celebration is a reflection of the unique blend of communities including Chinese, Vietnamese, Southeast Asians, Indians and Africans in this City of Maribyrnong suburb. From 10am to 10pm, the multicultural central shopping area of Hopkins Street will be transformed by costume parades, traditional lion dances, cultural performances, food and market stalls and carnival games and rides. If you're looking to celebrate the Lunar New Year late into the night, then the annual festival in Box Hill is the place to be on 14 February. Organised by the Asian Business Association of Whitehorse and supported by the Whitehorse City Council, this event is one of the biggest in Melbourne, drawing some 80,000 residents and visitors. Held along Market Street and Whitehorse Road, the celebration runs from 1pm to 1am. Highlights include the parade of the Chinese God of Fortune or 'Cai Shen', lion and dragon dancers, live bands, firecrackers and stalls offering Lunar New Year paraphernalia and merchandise. There is also a giant Buddha statue for devotees and visitors to pray and give thanks for the new lunar year. Presented by the Springvale Asian Business Association and the City of Greater Dandenong, the annual Springvale Lunar New Year festival draws over 60,000 residents and visitors. Buckingham Avenue will once again be transformed into a giant festival marketplace from 9am to 9pm while celebrations continue in the adjacent retail areas. You and your family can enjoy browsing a line-up of stalls offering multicultural food and everything else from art and craft to health food and real estate. There are also amusement rides like the Ferris Wheel and Giant Slide for kids. Live entertainment includes lion and dragon dances, Vietnamese and Khmer folk dancing, martial arts demonstrations and many more. Penjing Tea Garden, 16 Feb to 1 Mar, 11am to 5pm daily - enjoy the traditional art of Chinese tea in a Chinese Bonsai or 'Penjing' setting along with classic Chinese music. A Penjing workshop is also available on 22 Feb at 2 pm based on $30 per person. Free Open Day, 22 Feb, 12pm to 5pm - The Museum is available to visit for FREE. You and your family can learn about the heritage and culture of Australia's Chinese community and see the world's largest processional dragon. Tianjin Crafts, 24 to 27 Feb, 1pm to 2pm daily - You can learn the art of paper cutting, kite making, Chinese New Year pictures and calligraphy directly from the experts from Tianjin, China. The workshop is FREE with Museum admission. Located along Little Bourke Street and the alleys that link the area to Bourke Street and Lonsdale Street, Melbourne's Chinatown is the longest continuous Chinese settlement in the western world that dates back to the gold rush days of the 1850s. It becomes the centre of attention with a massive celebration every year during the Lunar New Year. You and your family can enjoy Chinese opera and singing, arts and craft, calligraphy, Chinese chess competitions, lion and dragon dances, karaoke competition, market stalls and plenty of firecrackers from 10am to 10pm on 19 February. Don't miss the iconic Dragon Parade hosted by the Melbourne Dai Loong Association at 10am on 22 February. The giant dragon with head, body and tail is carried by volunteers and accompanied by an entourage of lantern and animal bearers which departs from the Chinese Museum in Chinatown. The Queen Victoria Market is a centre of community activities in Melbourne. In addition to major events like the Wednesday Night Market and Luna 1878, the city's favourite market is also the place to enjoy the Lunar New Year season. It will be hosting over 10 days of FREE celebrations which include market stalls, lantern displays and a 15-metre long dragon on Queen Street. You can also enjoy traditional Chinese lion and dragon dances at Queen Victoria Market on the below dates and times. 21 February at 1pm from the corner of Queen Street and Victoria Street. 25 February at 7pm from the corner of Queen Street and Victoria Street. Melbourne's favourite public venue, Federation Square joins in the Lunar New Year celebration with a multicultural program that pays both homage to the Chinese culture and brings all communities together. Highlights include the Electric Dragon by multimedia artist Georgie Pinn, Tai Chi and Qigong demonstrations, Chinese cultural music, lion dances and many more. Visit the website for the schedule. The City of Monash celebrates Lunar New Year with its annual Glen Waverley Chinese Lantern Festival on 1 March. This major community celebration organised by the Monash Chinese Events Organising Committee and supported by the Monash City Council will transform King's Way into a giant event area with a main stage and stalls. From 11am to 8pm, you and your family can enjoy live music performances, Chinese art, mahjong games, martial arts demonstrations, lion dance, firecrackers and treats from international food stalls.